This year in our Classical Conversations memory work, we are memorizing the endings for Latin nouns. I love that the CC program takes so much time to really memorize these vital bits of information. Sometimes it's challenging as a parent to memorize something when you don't understand it's purpose. Before I started studying Latin with my son, I was right there with you! 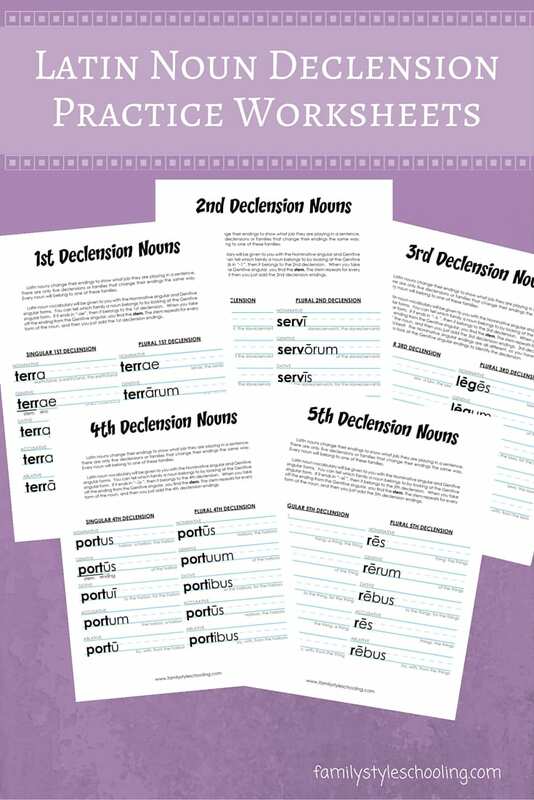 I've created some fun printables to help increase your understanding of Latin nouns as well as offer your students some practice in playing with Latin nouns. This post may contain affiliate links. Please see my full disclosure for more details. As a Challenge I tutor, I know how valuable the Foundations memory work truly is in the day to day assignments from our Henle Latin text. I can't tell you how often I've sung my little noun declension ending songs to help figure out which form of the word I needed for my translation work. Last year I've started my 5th grader in the Henle text at a slow pace. We made it through Lesson 2 in our first year! We picked up where we left off this year and we're half way through Lesson 3. Challenge A will go through Lesson 15, so I figure any exposure I can give her now will benefit her studies later. My 4th grader isn't quite ready for the Henle text yet, so we have decided to focus on vocabulary and declining a whole lot of nouns this year. She has just been writing them in a spiral notebook, but I decided to make a printable for her to work from to further solidify the meaning of each form while she works without adding a whole lot of extra writing. 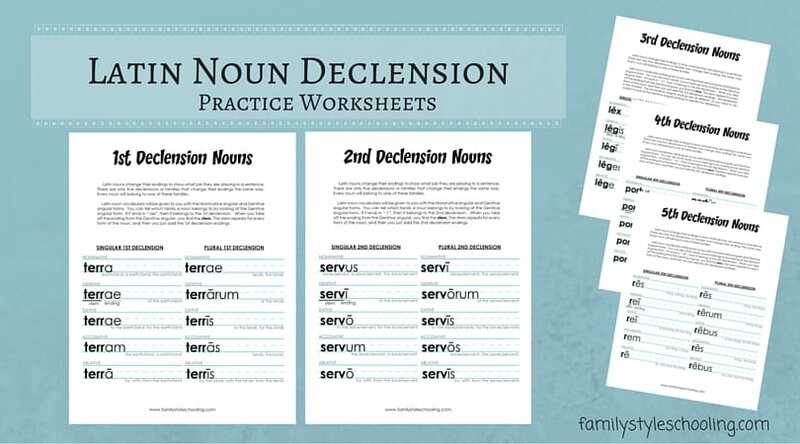 I've created a set of worksheets for each declension. The vocabulary in the worksheets comes straight from the Henle text. Third declension is one of the trickiest, but I've limited the vocabulary in that section only to the regular nouns that decline like the song memorized in Classical Conversations Foundations program (or for those of you who are familiar with Latin, the 3rd Declension Masculine/Feminine nouns like "lex"). Click here, or click on the image below to download the free worksheets. If you'd like to branch off into other vocabulary, here's a blank worksheet for your students to fill out. You'll need to help them identify which declension the noun belongs to, and then find the stem in the genitive singular. Then happy declining! My youngest was super excited about having a new way to practice declining her Latin nouns. I printed off two copies of each set to spiral for her as her little bit of Latin work each day. I like to spiral across the top because she's a lefty and then the spiral doesn't get in her way! 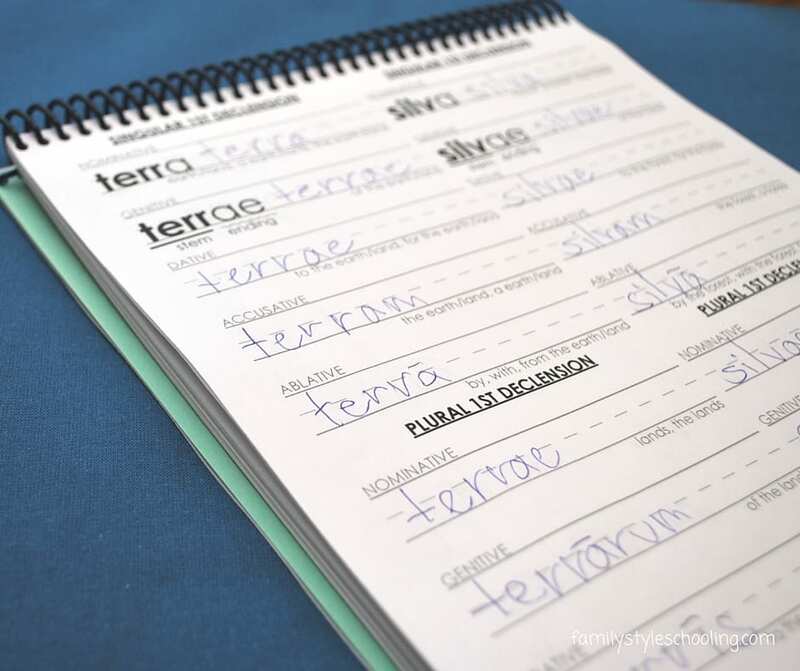 What questions do you have about declining Latin nouns? Are you looking for a more advanced version of study tools for Latin declensions? 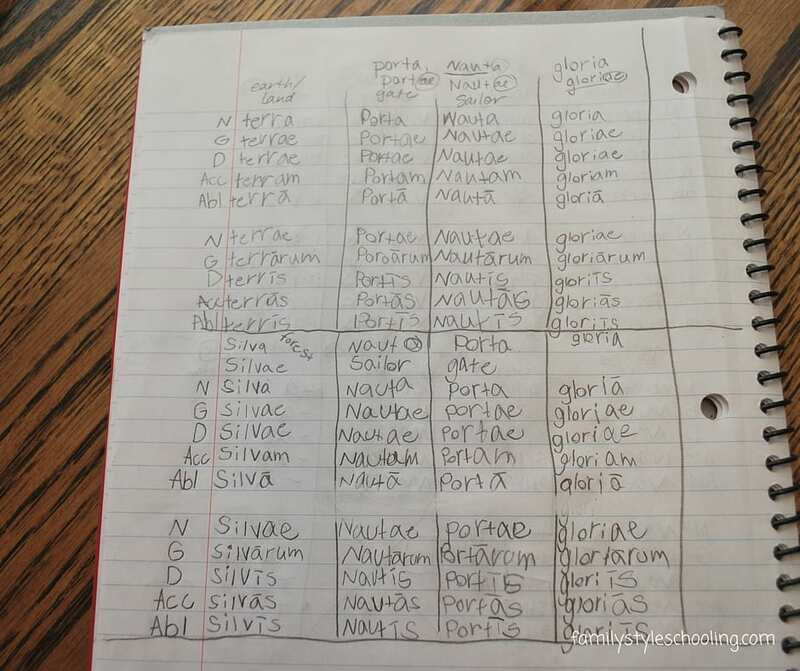 Check out my Latin Declension Mastery Charts. 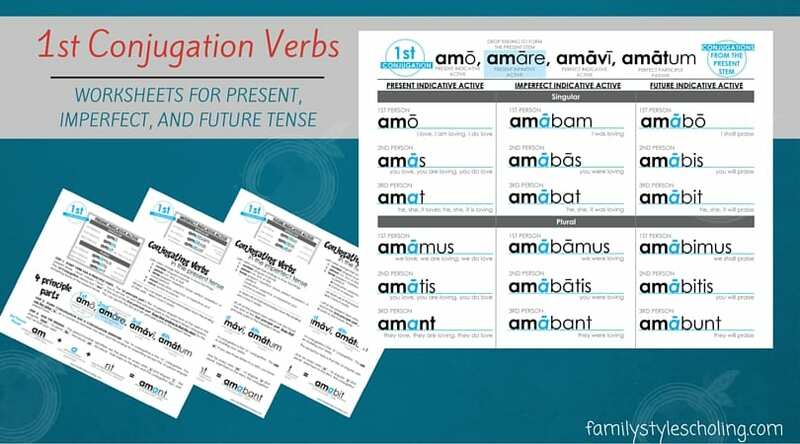 Interested in learning more about Latin Verb Conjugations? Click the image below for Verb worksheets! This is fabulous! I have two 6th graders and have been trying to get them ready for Ch A. This will help tremendously! Amazing! Thank you so much! Could you post a blank page where we could write in any noun of our choice? Thank you! Great idea! I’ll add that on soon. I just added a blank page to the post! Enjoy! I also thank you for sharing these! I hope you don’t take this as overly critical (it is not intended that way, but written responses lack some inflection and tone): I am curious why you did not include any neuter nouns and why you consider senatus and deus to be singular only. One can talk about the senates of several states or countries, and while there is only one God, the Romans’ and many others’ mythologies speak of multiple gods (and the forms do exist). Students who read more advanced Roman literature will encounter the plural of deus, for sure. Thanks for the input! 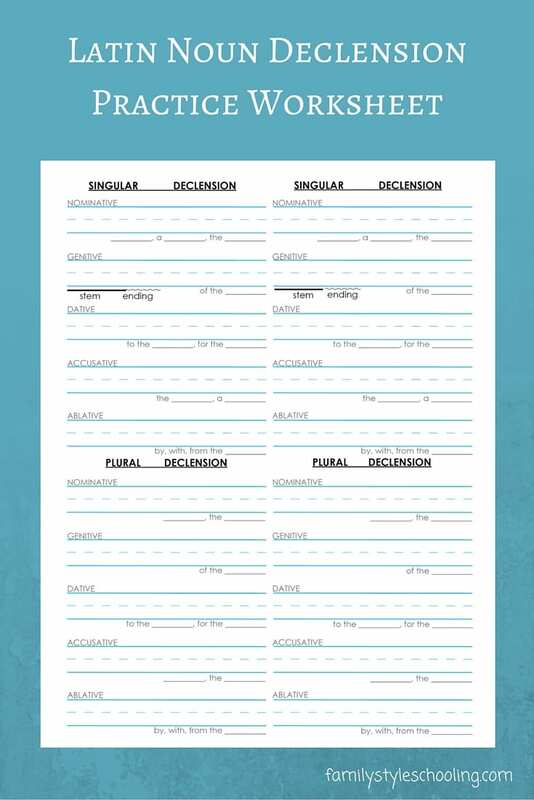 I created these worksheets to help students of Classical Conversations who were memorizing the declension endings. They don’t memorize any neuter forms at that point, so I didn’t want to over complicate the worksheets with neuter nuances. I do include them in my declension charts that are intended for older students. We are also working specifically towards Henle’s Latin, which only uses Deus in the singular (as the Christian God). Henle mentions adventus, equitātus, and metus are declined only in the singular, so I guess I extended that to senatus. I’ll adjust that one! When they reach more advanced translations they will have to adjust to each author’s usage of vocabulary, so it’s always good to keep checking! Thank you SO much for this Betsy! I have shared it with our CC Community. We are attempting a little Latin this year and this helps and also helps me make sense of it all! You’re welcome! I’ve learned so much along with my son. Glad it helps! This is fantastic. As a first time CC Tutor this year, this helps me see it all come together. Thank you for sharing this amazing resource. As a parent of a Ch. A student, these will be wonderful for extra practice. Thank you so much for sharing! I don’t know if it is my & my printer, but the blank page doesn’t all print out on the same page. It actually was very enlarged and each page printed on 3 sheets of paper. It comes up in a different format than the other pages. Suggestions?? I’d love to be able to have some blank pages for my son to use. Thanks! You’re welcome! Thanks for letting me know. I linked to the jpg instead of a PDF. I fixed the link! Try again! Oh my!!! Love those. Thank you! Thank you! I’ll be making myself a spiral too. My oldest is starting Ch. A next year and I need to prepare too! I love hearing moms that are diving into Latin with their kids. I have really enjoyed learning this language…never expected to! Oh thank you, thank you! I was looking for something more to do with my 6th grader this year. This is perfect for next semester. This is truly AWESOME! I have tutored Latin in Challenge A and currently tutor B. I know how well students can perform in Henle Latin when they enter Challenge having mastered the declensions. I will make this a spiral bound notebook for my 6th grader. Thank you for taking the time to create this resource and being kind enough to offer it for free. You are welcome! I totally agree…memorizing the declensions makes the Henle Latin so much more approachable. Enjoy! This is fantastic – thanks, Betsy! Thank you so much, Betsy! I tutor Foundations masters and Essentials, and I have encouraged them over and over and over to master that Latin. They are doing very well, but I think I will use these worksheets in review time to help them understand what this will be in Challenge A. Your help is gratefully appreciated. Thank you! We can use all the practice with declensions that we can get! God Bless You! This will help so much with memory master for my 4th grader! Thank you!!! We are studying Latin and I’ve been looking for a way to help them understand the changes. I work at a Classical Co-op. I teach the students 2x a week and the parents teach them 3x. Could I either use your sheets with my 4 classes or put your sheets on my resources page for parents to use. Denise, thanks for stopping by! You’re welcome to print them for your class, or add a link to my website on your parents resource page. You just can’t store a digital file somewhere for your families to download. Hope you enjoy! I can’t seem to find a way to print the worksheets? Any suggestions? I also have a lefty and love the idea to spiral bound at the top!! Do you print the pages front and back? I didn’t but I’m sure you could!